4- THOMAS D. HARGRAVE was born Abt. 1797 in Logan Co., Kentucky, and died April 27, 1874 in Putnam Co., Missouri. He married CELIA FRENCH December 26, 1816 in Posey Co., Indiana, daughter of MOSES FRENCH and JOSEPHINE UNKNOWN. She was born Abt. 1798 in Kentucky, and died 1850 in Putnam Co. Missouri. 5-JAMES HARGRAVE, b. 1821, Indiana; d. Deceased. 5-AIDELINIA TRALONA HARGRAVE, b. March 05, 1822, Bourbon Co., Kentucky or Indiana; d. February 07, 1905, Kingsville, Johnson Co., Missouri. Marriage 1 Solomon T. Hobbs b: 3 MAR 1817 in Haycraft Fort, Severns Co., Kentucky. 5-MARCUS A. HARGRAVE, SR, b. 1833, Illinois; d. Abt. 1890, Putnam Co Missouri. He married MARY ANN UNKNOWN Abt. 1855. She was born Abt. 1839 in West Virginia, and died Abt. 1906 in Putnam Co. Missouri. 6-WILLIAM HARGRAVE, b. 1855, Missouri; d. Abt. 1893, Putnam Co., Missouri. He married (1) NANCY A. BILES Abt. 1877, daughter of ENOS GRAHAM BILES. She was born September 1860 in Missouri. He married (2) LAURA F. UNKNOWN Abt. 1892. She was born Abt. 1860. 6-MARCUS A. HARGRAVE, JR, b. 1880, Missouri; d. Abt. 1904, Putnam Co., Missouri. 5-EMELINE HARGRAVE, b. December 1834. She married (1) ASA LUPTON June 03, 1855 in , Putnam Co., Missouri. He was born 1824 in Ohio. She married (2) UNKNOWN TIPTON Abt. 1880. He was born Abt. 1834. SETH J. HARGRAVE, b. 1840, Illinois. 5-NANCY JANE HARGRAVE, b. 1829, Indiana; d. Oregon; m. UNKNOWN WHITAKER, Abt. 1850; b. Abt. 1825. 5-RACHEL HARGRAVE, b. 1825, Indiana. She married JOHN PARTON Abt. 1841. He was born 1818 in Missouri. 5-MARGARET HARGRAVE, b. 1832, Illinois. 5-SARAH HARGRAVE, b. Abt. 1834; m. UNKNOWN LEWIS, Abt. 1855; b. Abt. 1834. 4-NANCY HARGRAVE, b. December 24, 1800, Logan Co. Kentucky; d. 1854; m. JOSIAH STEWART, 1818; b. Abt. 1800. 4-ROBERT HARGRAVE, b. Abt. 1804, Logan Co., Kentucky; d. 1873, , White Co., Illinois; m. NANCY UNKNOWN, April 07, 1832, White Co., Illinois; b. Abt. 1804. 2- SARAH HARGRAVE, b. Abt. 1805, Logan Co., Kentucky. 2-MARY ADELINE HARGRAVE, b. Abt. 1806, Logan Co., Kentucky. 4- SETH HARGRAVE, b. Abt. 1808; m. UNKNOWN UNKNOWN, Abt. 1828; b. Abt. 1808. 4- EMMALINE HARGRAVE, b. Abt. 1815, Indiana; d. January 21, 1893, Cameron Parish, Louisiana; m. JOHN WETHERILL SR, October 01, 1832, Posey County, Indiana; b. 1803, Pennsylvania; d. 1876, Louisiana. Birth: ABT. 1730 in , England ? Death: Deceased in , , North or South Carolina or Alabama ? ALIA: John or Robert or Samuel or Henry plus Hargrove or Hartgrave or Hargraves or etc? Immigration: A soldier named William Hargrave apparently came to Georgia with the Br. 25th Regmt. of Foot Inf. The unit was apparently disbanded 29 May 1749. Military Service: William Hargrave of N.C., Ensign 10th North Carolina, 16th January, 1778; transferred to 1st North Carolina, 1st June 1778; Lieutenant, 30th Mar, 1780; taken prisoner at Charleston, 12th May 1780; exchanged 14th Jun 1781; retired 1st January, 1783; Ours ?? _NAMS: Not sure of his parents, grandparents, descendents or ancestors. Father: John Hargrave b: AFT. 1699 in , , England ? Marriage 1 Unknown Bishop b: ABT. 1733 , Married: ABT. 1754 in , , South Carolina or ? 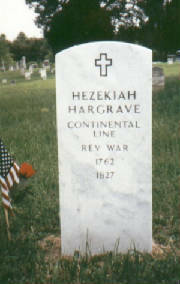 Hezekiah Hargrave, Born 1762 in North Carolina, died July27, 1827, Indiana. buried: Wesley Chapel Cemetery. Married Susannah Mc Murtry b. 1767, d. April 24, 1827., Buried: Wesley Chapel Cemetery. Revolutionary War Soldier. He served in the 4th South Carolina Regiment under George Washington. His service record was taken from Colonial & State Records, Vol. 16, Private 1085 - 10th Reg. Brevards Co. - 1782. 18 Months service. 6-18-1861 .Married Susan Gardner 1808, Married Elizabeth Arnold,1/18/1827 whom he divorced and then married Hannah Mc Neely. 4- James Harrison Hargrave 1816-1835 Married Kizziah Harpole**1816- ( buried at "the Old Harpole Homestead"
and is probably now lost. This Wesley Chapel tombstone was dedicated by local DAR in 1990. NOTE: THIS IS JAMES HARGRAVE, Birth: ABT. 1796 in Logan Co., Kentucky.